New York, 1997, 1st edition, 1st printing. [The first edition of this book, and most Random House books, states "First Edition" with the lowest number of printing being a 2] 293 pp, b/w photos, maps. See the example and explanation below. Hardcover with dust jacket. Fine condition. On May 10, 1996, eight climbers, some paid guides, some clients, died on Mount Everest. It was the most sensational event in mountaineering history since Everest and Annapurna were first climbed. 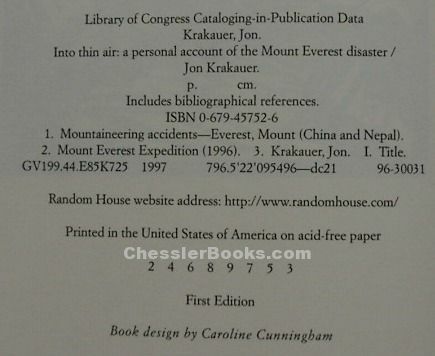 This is the copyright page of a true first edition of Into Thin Air. The unique way of omitting the number 1 is common to all Random House books, possibly including Random House, Knopf, Times Books, Bantam, Dell, Crown, Clarkson Potter, Broadway, Doubleday, Anchor, Schocken, Vintage, Ballantine, and about a dozen other publishing names. The following morning, he learned that six of his fellow climbers hadn't made it back to their camp and were desperately struggling for their lives. When the storm finally passed, five of them would be dead, and the sixth so horribly frostbitten that his right hand would have to be amputated. Into Thin Air is the definitive account of the deadliest season in the history of Everest by the acclaimed journalist and author of the bestseller Into the Wild. On assignment for Outside Magazine to report on the growing commercialization of the mountain, Krakauer, an accomplished climber, went to the Himalayas as a client of Rob Hall, the most respected high-altitude guide in the world. A rangy, thirty-five-year-old New Zealander, Hall had summited Everest four times between 1990 and 1995 and had led thirty-nine climbers to the top. Ascending the mountain in close proximity to Hall's team was a guided expedition led by Scott Fischer, a forty-year-old American with legendary strength and drive who had climbed the peak without supplemental oxygen in 1994. But neither Hall nor Fischer survived the rogue storm that struck in May 1996.